William Minshall Birchall - Limehouse Reach, River Thames 1920 - Online gallery supplying original fine art. Trending Modern British and Contemporary Welsh. Available for sale from Big Sky Fine Art; this original painting by William Birchall dated 1920.<br> The watercolour is presented and supplied in its original period frame and behind glass. In 2015 the mount was replaced using conservation materials and the frame restored on our instructions.<br> The watercolour is signed, titled and dated lower left.<br> <br> This world-class marine artist combined accuracy with great style and charm and specialised in watercolour works. He was born in Cedar Rapids, Iowa, US on 10th September 1884. His father, William Henry Birchall was a business manager and his mother was Rosetia Beauchamp. William was educated at a number of schools, mostly privately. He always had a brush in his hands, as long as he could remember.<br> <br> Although he was born in America, he travelled quite widely, and chose to settle in the UK, living in Hastings for many years. He is also known to have painted from an address in Buckingham Street, Strand, London. <br> <br> He is especially well known for his maritime scenes from around the English Channel and the Thames Estuary. He painted many of the great passenger liners of his day, as well as clippers, steamships and smaller working boats. Some of his works are reproduced in The King’s Ships, Britannia’s Bulwarks and similar publications. One of his paintings was purchased by H.M. King Gustav of Sweden. <br> <br> His work has been exhibited at the Walker Art Gallery, and today he is represented in the Peabody Museum, Salem, and the National Maritime Museum, Greenwich. His works are also in many private collections all over the world. 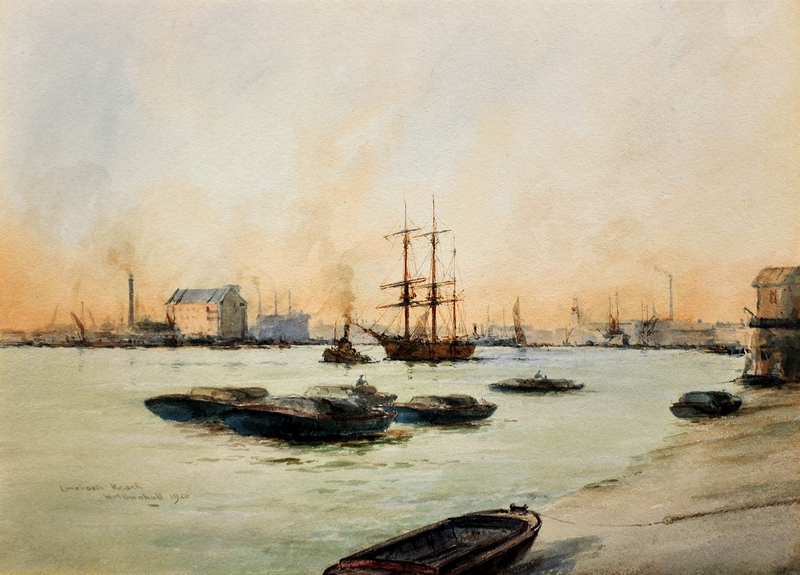 Prices of his works hold well, although originals are relatively rare.<br> <br> This watercolor is entitled Limehouse Reach and was painted in 1920. Limehouse Reach is a section of the River Thames which runs from Shadwell, through Ratcliff and then Limehouse and on to Millwall. On the opposite side of the Thames is Rotherhide. Today, this area of East London is in the borough of Tower Hamlets. The painting shows the docklands area, with barges, tugs and a sailing ship or barque on the river, with warehouses in the background and smoking chimneys. Available for sale from Big Sky Fine Art; this original painting by William Birchall dated 1920. The watercolour is presented and supplied in its original period frame and behind glass. In 2015 the mount was replaced using conservation materials and the frame restored on our instructions. The watercolour is signed, titled and dated lower left. This world-class marine artist combined accuracy with great style and charm and specialised in watercolour works. He was born in Cedar Rapids, Iowa, US on 10th September 1884. His father, William Henry Birchall was a business manager and his mother was Rosetia Beauchamp. William was educated at a number of schools, mostly privately. He always had a brush in his hands, as long as he could remember. Although he was born in America, he travelled quite widely, and chose to settle in the UK, living in Hastings for many years. He is also known to have painted from an address in Buckingham Street, Strand, London. He is especially well known for his maritime scenes from around the English Channel and the Thames Estuary. He painted many of the great passenger liners of his day, as well as clippers, steamships and smaller working boats. Some of his works are reproduced in The King’s Ships, Britannia’s Bulwarks and similar publications. One of his paintings was purchased by H.M. King Gustav of Sweden. His work has been exhibited at the Walker Art Gallery, and today he is represented in the Peabody Museum, Salem, and the National Maritime Museum, Greenwich. His works are also in many private collections all over the world. Prices of his works hold well, although originals are relatively rare. This watercolor is entitled Limehouse Reach and was painted in 1920. Limehouse Reach is a section of the River Thames which runs from Shadwell, through Ratcliff and then Limehouse and on to Millwall. On the opposite side of the Thames is Rotherhide. Today, this area of East London is in the borough of Tower Hamlets. The painting shows the docklands area, with barges, tugs and a sailing ship or barque on the river, with warehouses in the background and smoking chimneys.